Studio Athletica - Downtown Toronto upper leg physiotherapy - Call Now. Below you will find a list of symptoms and conditions that we see with our Downtown Toronto upper leg physiotherapy clientele. At Studio Athletica, we specialize in several different services that can help treat your health problems. Please feel free to read more about your symptoms, conditions and our suggested treatments, or contact us to pinpoint the best treatment to heal your body. The downtown Toronto upper leg physiotherapy program is the gold standard. Our Downtown Toronto upper leg physiotherapy program sees a lot of tendinopathy. Tendinopathy refers to an injury to the tendon. Tendons are the tough fibers that serve as the connector between the bone and muscles. Tendon injuries are most common in and around the joints like the knee, elbow, or ankle however, high (proximal) hamstring tendinopathy can cause pain that radiates from the hamstrings, down the back of the thighs making it difficult to bend at the hips. People with high (proximal) hamstring tendinopathy will often notice a pattern to their pain. For example, the pain may appear at the same time into a workout or pain when sitting, running, or sprinting. Our Downtown Toronto upper leg physiotherapy program sees a lot of muscle strains & tears. 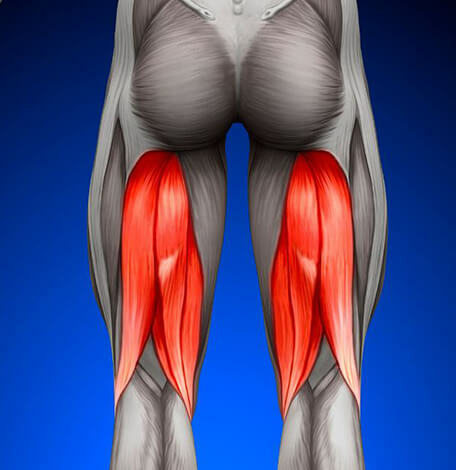 The upper leg, thigh area consists of three sets of muscles: the hamstring muscles (back of the thigh), the quadriceps muscles (the front of the thigh), and the adductor muscles (inside). All three muscles work together to straighten and flex the leg. Muscle strains typically happen when a muscle is stretched beyond it’s limits or the muscles fibers tear. Muscles strains can be quite painful and frequently occur near the point where the muscle joins the tough, fibrous connective tissue of the tendon. Someone who experiences a muscle tear will feel immediate pain, the area around the injury will be tender to touch, including visible bruising if the blood vessels were broken. Our Downtown Toronto upper leg physiotherapy program sees a lot of muscle contusions. Corked Thigh is also known as “dead leg” or a “charlie horse.” A corked thigh is very common in contact sports. In simple terms, it’s when your thigh muscles are “kneed” by an opponent during a tackle or similar impact. What happens is, the muscle is crushed against the underlying bone. The impact of this causes significant bruising. A mild bruise or strain may heal within a few weeks. A more severe bruise or strain may take 6 weeks or longer.